We shape atypical itineraries. Let an expert work out the best private Cambodia tour imaginable. 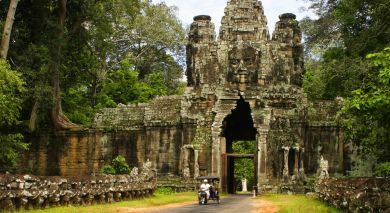 First tick off some must-do’s, then kick back and change the pace of life on your Cambodia vacation. Start at the country’s biggest draw Angkor Wat. Spread over 400 acres the temple complex is Cambodia’s crown jewel. The grandeur of its size, the intricacy of its bas-relief sculptures, and the symbolism and architectural genius behind it cannot be overstated. Over a million visitors arrive here and in the nearby town of Siem Reap each year. As a result, the city is something of a boomtown catering to the crowds. The wounds of the genocide perpetrated by the Khmer Rouge in the 1970s are an integral part of Cambodian history. 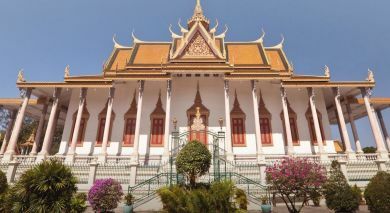 Understand this country’s past by visiting the Tuol Sleng Genocide Museum and Choeung Ek Killing Fields, while in the bustling capital Phnom Penh. Later, visit the rich, ornate Royal Palace with its exquisite gardens. At dusk, join the local population at the river, where waterfront bars line the boardwalk and open-air exercises and dance lessons are often conducted. Reconnect with life’s fundamentals by exploring places outside the main cities. Take a riverboat on the Tonle Sap and Mekong rivers, travel to places like Kampot, famous for its pepper, or Battambang, with its crumbling colonial architecture. Spend time interacting with friendly locals. If you’re looking for an atypical itinerary, you’ve come to the right place. Enchanting Travels consultants will provide all the inputs and suggestions you need, and fit your trip itinerary to suit your every need. The mystical Angkor Wat temple complex is a highlight of any Cambodia tour. Cambodia has a warm / hot tropical climate that is relatively calm and consistent throughout the year. Our destination experts share an overview on when to visit the ancient temples, charming towns and blissful beaches. There’s more to Cambodia than Angkor Wat. 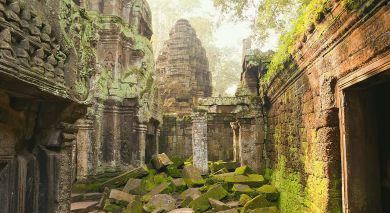 On your tour of Cambodia, experience the best of the fascinating culture, heritage, and blissful beaches. Our destination experts share an overview on the most popular highlights, attractions and activities. 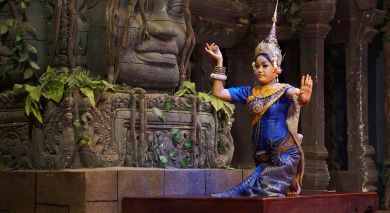 During your private Cambodia tour, you will notice that the culture and tradition are steeped in its history. You can expect a fusion of local traditions with the practicing Buddhism and Hinduism, especially when taking one of our Angkor Wat tours. The official language of Cambodia is Khmer. Regardless of gender, when meeting someone for the first time, press your palms together in front the of the chest, smile politely and, as you bow, say Chumreap Suor. The lower the bow, the more respect you are giving. When addressing someone, you can use the title Lok for a man and Lok Srey for a woman before their name. Choice of transportation in Cambodia is still quite limited. Cars that are available for usage are typically Toyota or Hyundai models from the late 1990s. While being old, these cars thankfully have air-conditioning for your comfort. Wearing a seatbelt in Cambodia is still not common practice – be aware that the vehicles in which you travel won’t be fitted with seat belts in accordance with current convention. If you are giving a gift during one of our Cambodia tours, avoid white gift wrapping paper and always present gifts with both hands. Note that Cambodians generally do not celebrate birthdays. 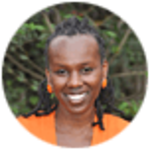 If you take out the local currency, Riel, note that you cannot convert it back to your own currency. With this in mind, limit how much cash you get exchanged. 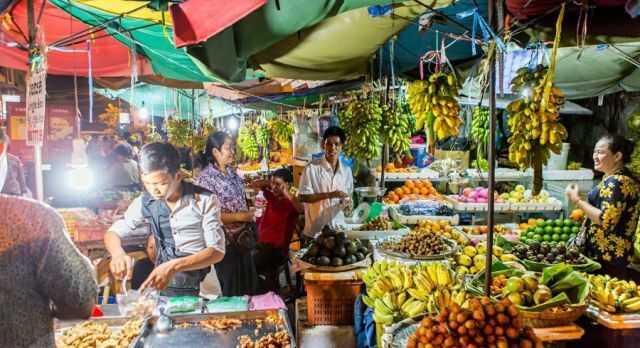 The cuisine of Cambodia has a wonderfully fresh approach and it has been influenced by the French during colonisation, from Chinese immigrants, as well as its neighbouring countries, Thailand and Vietnam. On one of our Cambodia tours, you can also expect Japanese and European cuisine in coastal towns, such as Sihanoukville, located in the southwest of the country. Naturally, the coast is renowned for its seafood. Why not try a few typical Khmer dishes? A typical Cambodian meal usually consists of soup, salad, a main fish dish, vegetables and rice. Meals are often completed with fresh fruits and delicious sticky rice. Many restaurants in Cambodia provide rice for free. Cambodia was for centuries divided into rival states before King Jayavarman II founded the Khmer Empire. As a nation of animists, the integration of Hinduism and Buddhism was introduced easily in the 9th century and coexisted with the traditional belief that spirits inhabited the earth. During the golden age of the empire that existed until the 13th century, great temple complexes were built with regal and fine carvings, including the notable Angkor Wat. During the 16th century, Cambodia was conquered by the Thai, destroying the capital city, Phonm Penh, at which time European missionaries also arrived. By the 19th century, Cambodia was under the protectorate of France. Cambodia became its own independent kingdom under Norodom Sihanouk in 1953. When the Vietnam War crossed into the border of Cambodia in the mid-1970s, the communist and brutal agrarian regime of the Khmer Rouge was born. This led to what is considered one of the worst genocides in modern history that today is remembered by the mass graves known as the Killing Fields, which you can visit on one of our private Cambodia tours. The civil war ended when the Khmer Rouge were successfully removed by Vietnamese troops and the People’s Republic of Kampuchea was formed. 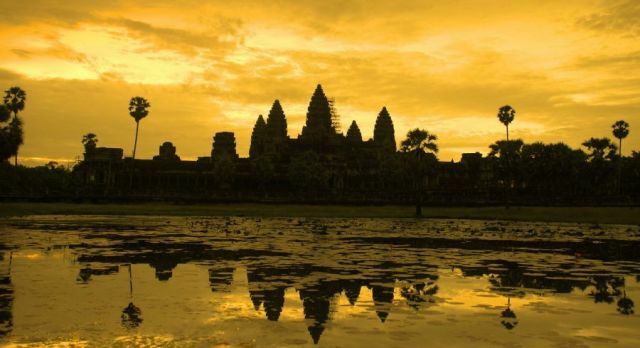 Today, despite a heavy-hearted legacy, Cambodia is ever optimistic about its future, and Cambodia tours are playing a positive role in boosting an emerging economy.